Round Out Your Summer Workouts with a Live DJ Ride! Summer may be getting close to coming to an end, but there’s still plenty of time to squeeze in some fun, calorie-burning workouts before the cool weather rolls in. 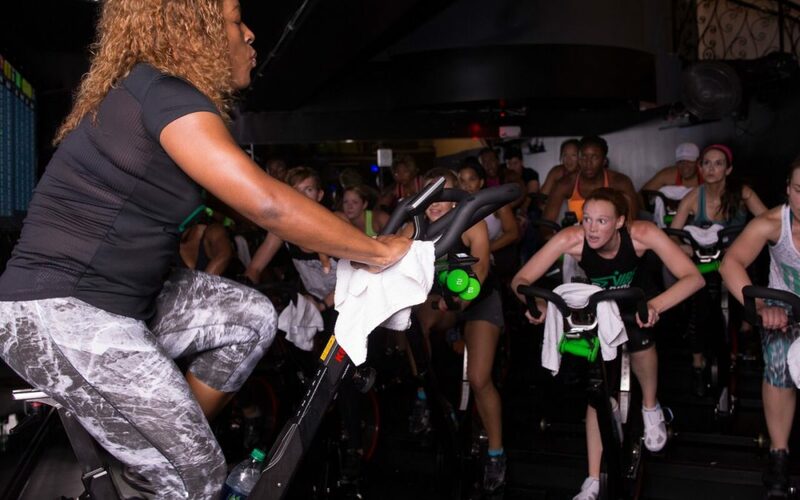 At Vibe Ride, we’re happy to help you maintain that summer body with one of our most unique and exciting indoor cycling classes – Live DJ rides! Imagine going to your favorite club or bar on a Friday night – the music’s fun, the energy’s incredible and everyone’s having a great time. Wouldn’t you love to have those same vibes when working out? Well, that’s exactly what our Live DJ rides seek to do! We take some local, talented DJs, our incredible and motivational coaches and your energy to create cycling classes that are so fun that you’ll forget that you’re working out! We love to make our classes fun and unique, so we bring our DJs front and center. In fact, our DJs typically get on the stage right next to our instructors so they can make sure they are bringing the energy and excitement typically experienced on your night out on the town. They also work alongside our top-notch instructors to deliver the motivation you may need to make it up that hill or through the last few seconds of that sprint. Together, the two powerful forces of our DJs and instructors will push you to your limits and help you hit some of your best energy scores, all while helping you forget about how much time is left on the clock. Our Live DJ rides make use of the principles of our Rhythm Ride classes to ensure you’ll get the chance to dance along to all of your favorite tunes while getting in a full-body workout. Our instructors will help you realize the lower body benefits of indoor cycling with higher resistance during the slow songs. In addition, you’ll sprint along during the drops and breakdowns to amp up your cardio benefits. Finally, you’ll work your upper body and abs with moves like dips, punches and even weights to deliver that full-body workout you’re looking for. Throughout the upper and lower body moves, both our DJ and instructor will motivate you with uplifting words and popular beats, so much so that you won’t even realize that you’re working out! But, by the end, you’ll realize that your muscles are burning and you torched hundreds of calories without the pain that and slowness that may be experienced with other workouts. Throughout your indoor cycling workout, you’ll get to track your performance and progress with our popular Performance IQ System, which runs on the TVs displayed at the front of the class. You’ll see your bike number, power (which is based on resistance) RPM (which refers to your rotations per minute) and energy (which a combination of all of your efforts and represents a fraction of your total calories burned), so you can see just how great of a workout you’re getting, even when you feel like you’re just spending some time singing and dancing along to your favorite songs with other like-minded people!